I have just been waiting and waiting for the day that I would get to tell you about Cannensi, a business run by my best friend Jenny's Italian beau. Raffaele has a vineyard in the Apulia region of Italy near the town of Barletta where he grows grapes and olives for making local wine and an award winning cold-pressed extra virgin olive oil. Barletta is a beautiful, small, historic town directly on the coast of the Adriatic Sea just north of Bari. I traveled to this lovely town on my first ever trip off of my home continent for one of the most memorable experiences of my entire life. I was lucky to travel in Southern areas that not many outside visitors experience. We rarely encountered people who spoke English but luckily Jenny spoke enough Italian to get us where we needed to go and to find all the things we needed to survive. Jenny moved to Barletta to teach English for a year where she met Raffaele who originally approached her for English lessons. Years later they are still together visiting each other often. Raffaele travels from Italy to visit Jenny in Winnipeg, Manitoba and Jenny gets the better end of the deal when she visits Italy (no offence to Winnipeg). Jenny has recently taken on the task of distributing Cannensi olive oil here in Canada and it is now being sold in Winnipeg. Through Cannensi, Raffaele also sells other fine foods that come from the South of Italy such as pastas, chickpeas and fresh cheeses. Jenny and Raffaele are strong proponents of the Slow Food movement and all of the products distributed by Cannensi support the Slow Food philosophy. A friend of mine from school was in Winnipeg recently and kindly picked up some products from Jenny for me to try out. I felt like a child on christmas morning as I pulled from a bag, two beautiful black bottles filled with Cannensi olive oil, a bag of orecchiette, a jar of oil packed sun dried tomatoes and a jar of marinated eggplant. I will definitely be making a pasta salad using these ingredients as part of my seven salads sequence. I cannot wait! 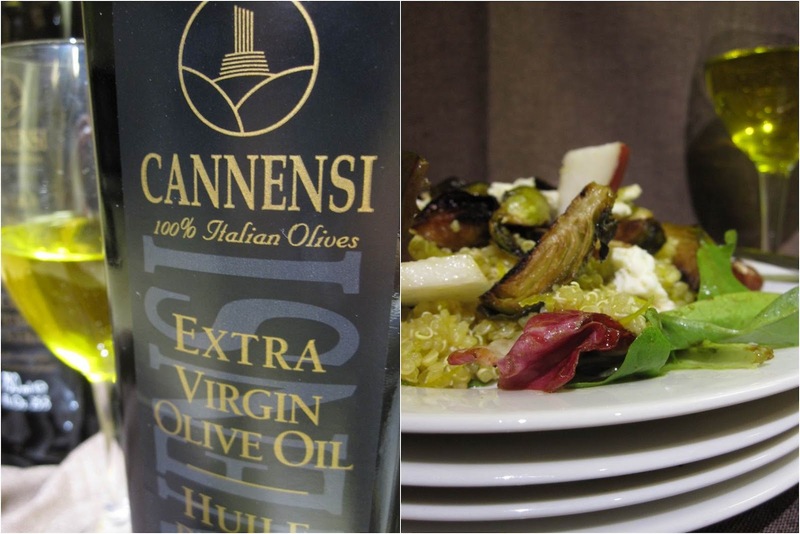 Cannensi olive oil is made from olives coming from the Coratina olive tree which originates from the Apulia region of Italy. The olives have low acidity and high phonoleptic qualities that give the olive oil an incredible flavour, a long shelf life and amazing health properties (as stated by Cannensi). You can watch a video to see how the olive oil is made here. I found the olive oil to have a striking deep yellow colour (as you can see). It has a rich, almost peppery but smooth flavour and was just lovely used in a simple salad dressing that clung boldly to the lettuce leaves that I tossed it in. If you are interested in knowing more or trying some Cannensi olive oil you can go to the Cannensi Canada website or find Cannensi Canada on Facebook. If you are closer to Italy than Canada then you can go to the Cannensi Italy website. In this salad the brussel sprouts are the stars. Quinoa makes this salad filling and the balsamic dressing on the lettuce leaves ties everything together. Don't grate the beets until you are ready to toss them with the quinoa because they will turn brown if left to sit. Also, I personally like gorgonzola slightly melted, so if you are like me, make sure your brussel sprouts are warm when you crumble the gorgonzola on top. Whisk together balsamic vinegar, olive oil and sea salt. Take 1/4 cup of the dressing and stir in brown sugar. Toss chopped brussel sprouts in the sweetened dressing and lay on a baking sheet lined with parchment paper. Toss shallots in a bit if olive oil as well and also place on baking sheet. Roast everything for about 20 minutes, turning once or twice during cooking. Cook brussel sprouts until dark, caramelized and slightly crispy. Meanwhile, bring water to low boil in a small pot. Stir in quinoa and cook, stirring often until tender, about 10 minutes. Drain and rinse quinoa, then set aside in a strainer until ready to use. Toss salad greens with remaining dressing and divide onto serving plates. 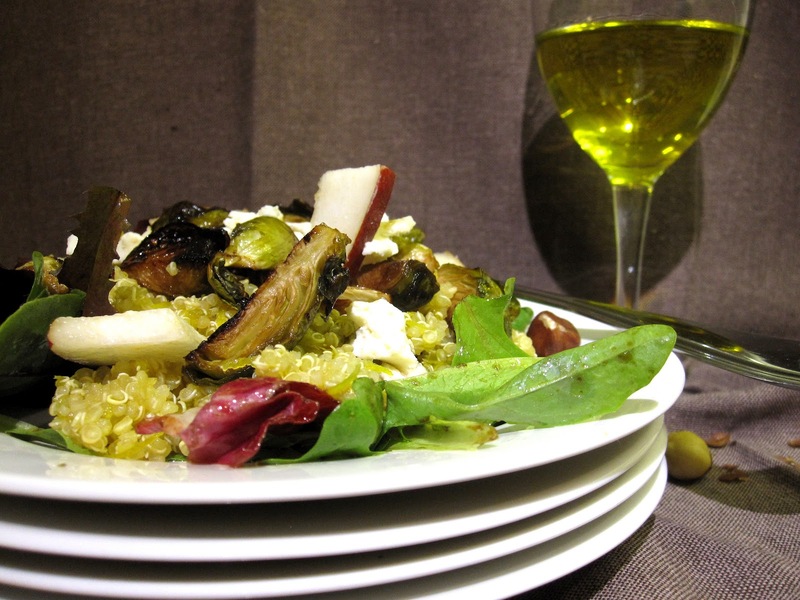 Toss quinoa with shredded beets and shallots and place a serving on top of greens. Finish by placing brussel sprouts, pear slices, chopped hazelnuts and gorgonzola onto salad.